Edition after edition, and for nearly a century, CRC's Standard Mathematical Tables and Formulae has served as a standard reference. 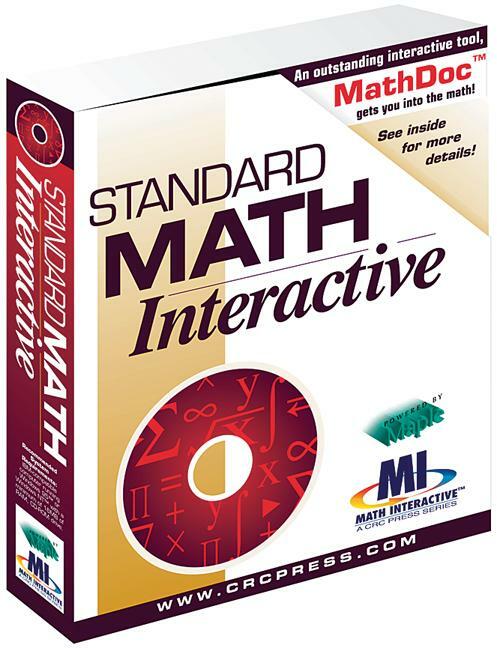 Now the old standard takes on a new electronic form - CD-ROM - and a new name - Standard Math Interactive™. Powered by the Maple™ symbolic math engine, Standard Math Interactive™ is an interactive powerhouse for students and professionals. Analysis: Constants. Special Numbers. Series. Fourier Series. Complex Analysis. Real Analysis. Generalized Functions. Algebra: Elementary Algebra. Polynomials. Number Theory. Vector Algebra. Linear and Matrix Algebra. Abstract Algebra. Discrete Mathematics: Set Theory. Combinatorics. Graphs. Partially Ordered Sets. Combinatorial Design Theory. Inclusion/Exclusion. Communication Theory. Costas Array. Difference Equations. Discrete Dynamical Systems and Chaos. Operations Research. Geometry: Coordinate Systems in the Plane. Symmetries or Isometries. Other Transformations of the Plane. Lines. Polygons. Circles. Conics. Special Plane Curves. Coordinate Systems in Space. Space Symmetries or Isometries. Other Transformations of Space. Direction Angles and Direction Cosines. Planes. Lines. Polyhedra. Cylinders. Cones. Spheres. Surfaces of Revolution - The Torus. Quadrics. Knots up to Eight Crossings. Differential Geometry. Angle Conversion. Continuous Mathematics: Differential Calculus. Differential Forms. Integration. Table of Indefinite Integrals. Table of Definite Integrals. Ordinary Differential Equations. Partial Differential Equations. Eigenvalues. Integral Equations. Tensor Analysis. Orthogonal Coordinate Systems. Control Theory. Special Functions: Trigonometric or Circular Functions. Circular Functions and Planar Triangles. Inverse Circular Functions. Spherical Geometry and Trigonometry. Exponential Functions. Logarithmic Functions. Hyperbolic Functions. Inverse Hyperbolic Functions. Gudermannian Function. Orthogonal Polynomials. The Gamma Function. The Beta Function. Error Functions and Fresnel Integrals. Sine, Cosine, and Exponential Integrals. Polylogarithms. Hypergeometric Functions. Legendre Functions. Bessel Functions. Elliptic Integrals. Clebsch-Gordan Coefficients. Integral Transforms: Preliminaries. The Fourier Integral Transform. Discrete Fourier Transform (DFT). Fast Fourier Transform (FFT). The Laplace Transform. The Z-Transform. The Hilbert Transform. The Hankel Transform. Tables of Transforms. Multidimensional Fourier Transforms. Probability and Statistics: Probability Theory. Probability Distributions. Queuing Theory. Markov Chains. Random Number Generation. Control Charts. Statistics. Confidence Intervals. Test of Hypotheses. Linear Regression. Analysis of Variance (ANOVA). Probability Tables. Signal Processing. Scientific Computing: Basic Numerical Analysis. Numerical Integration and Differentiation. Financial Analysis: Financial Formulae. Financial Tables. Option Pricing. Miscellaneous: Units. Calendar Computations. AMS Classification Scheme. Greek Alphabet. Professional Mathematical Societies. Electronic Mathematical Resources. Computer Languages. Fields Medals. Biographies of Mathematicians. ASCII Character Codes. "[Standard Math Interactive™] does for mathematicians what the word processor did for writers. The ability to bring tables, formulas, and graphs alive within a document allows for more vital exploration."